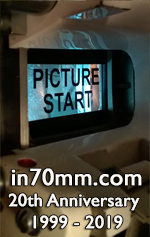 After a year the majestic cinema Mir 70 will become a place where true film fans of celluloid from many European counties - especially enthusiasts loving widescreen format - will meet. Three days of a rare occasion to see great 70mm movies screened on a 105 square meters of slightly curved screen and good opportunity to remember history of “old school” cinema technology in today's sterile digital era. And what can you looking forward to? See final film schedule below. Prices of accreditation are 800 CZK for 3 days and 650 CZK for 2 days pass. Traditional Widescreen Film Festival KRRR! 7.-9. april 2017, Krnov, Czech Republic. Curiosity: Amazement and very rare find - 30 minutes 70mm 3D short movie, never ran through projector until now!